Are solid state drives ready for the big time? Storage is the final frontier of PC performance; CPUs and graphics chips have long marched to the drum beat of inexorable performance improvements. Not hard drives, however. Granted, storage capacities have grown so fast you can now fit the combined wealth of all human knowledge on a £50 drive. Well, just about. But performance has only inched forward incrementally. At least, it did until solid state drives rocked up as consumer hard drives around five years ago. Since then, storage performance has joined storage capacity - and processor and graphics grunt, for that matter - on that relentless, Moore's Law-mandated journey of irresistible progress. For SSDs, however, it's not always been a smooth ride. To say the earliest drives delivered patchy performance would be borderline disingenuous. In hindsight, they weren't fit for sale, so rapidly and inevitably did their performance fall off with heavy usage. More to the point, while the headline sequential throughput achieved by SSDs is impressive, performance in more realistic random workloads is usually a lot less spectacular. Outright reliability has been suspect, too. Not only have several different generations of SSDs suffered from instability issues leading to classic blue screen PC stalls, but outright failures aren't exactly unheard of, either. The latter is a particular problem given that one of the main advantages of solid state storage over magnetic drives is meant be their lack of moving parts and, therefore, robustness. Put all together, the early history of solid-state storage failed to live up to the hype or potential. And yet much progress has undoubtedly been made. The introduction of the TRIM command in Windows 7 went a long way towards providing peace of mind when it came to performance degradation. While few, if any, drives maintain absolutely consistent performance levels over time, if you buy a drive with TRIM support you can be confident it won't turn into a stuttering, useless paperweight within months. But the question still remains: Are SSDs ready for mainstream consumption? Read on to find out. First, lets start with a few facts. Back in late 2007, a 16GB first-generation SSD, was yours for around £300. Peak sequential transfer rates were around the 30MB/s mark. Sobering stuff, isn't it? Today, £300 buys you 250GB, or thereabouts, of the finest SSD technology available, which is capable of speeds of up to 550MB/s. That's 15 times bigger and 18 times faster in less than five years. Do the maths and the destination in five years seems spectacular: Fancy a 4TB SSD capable of 10GB/s transfer rates for £300? As it happens, we don't think either capacities or performance will explode quite so spectacularly. 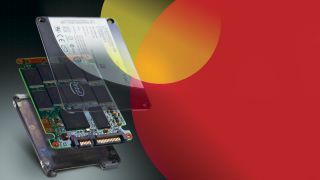 As we'll see, SSD technology is approaching maturity, so the pace of those early gains isn't going to be repeated. But the main moral here is that SSD technology has improved beyond all recognition. The latest offerings are now good enough for us to recommend them unreservedly. What's more, we reckon they've reached a point where usefully proportioned drives are now genuinely affordable. For us, the sweet spot is the current generation of 120GB and 128GB models. Prices start at a little over £100, with peak sequential performance as high as 500MB/s. That kind of capacity is sufficient for a full Windows installation, a range of applications and a respectably proportioned library of Steam games. On a related note, with SSDs at around 120GB at this price point, we're less convinced by the proposition of hybrid drives or SSD caching solutions. Our money-no-object preference has always been pure solid-state hardware. We're happy to say the balance between cost and capacity now makes that a more plausible proposition - spending an extra £50 on a motherboard with a 20GB cache drive doesn't make much sense when you can have the real thing for £100. As ever, the most important narrative arc in SSD selection involves controller chipsets. Over the years, controllers have been both the heroes and villains of the solid-state story. In the early days, the mere mention of the name JMicron was enough to pump fear into the hearts and insert visions of a lingering, stuttering death into the imaginations of PC enthusiasts. More recently, SandForce has emerged as an unlikely hero, taking on and beating the big boys. The fact that Intel, too, has now given in to SandForce and started using its controllers tells you all you need to know about both the difficulty involved in developing a really fast controller chipset and its importance in a given SSD - even Intel couldn't manage it.